StarWind presents new product lines for its major product: StarWind Virtual SAN. StarWind VSAN eliminates any need in physical shared storage by simply mirroring internal hard disks and flash between hypervisor servers. It maintains high performance and data high availability on minimalistic resources. StarWind Virtual SAN delivers performance and reliability using commercial off-the-shelf hardware, removing the need for costly proprietary components. StarWind Virtual SAN for Hyper-V is a Software-Defined-Storage stack designed specifically for implementation on the Microsoft’s virtualization platform. VSAN installs as a bare metal Windows application directly on the Hyper-V cluster nodes intended for the virtualization. Once installed, it creates a highly available storage pool for the entire cluster. StarWind VSAN for Hyper-V smoothly integrates with Windows Server management and security tools to provide administrators with a centralized user-friendly StarWind Management Console. StarWind Virtual SAN for vSphere is a VMware-only Software-Defined-Storage stack. A ready-to-go Linux VM installs on the cluster nodes to share their storage resources. 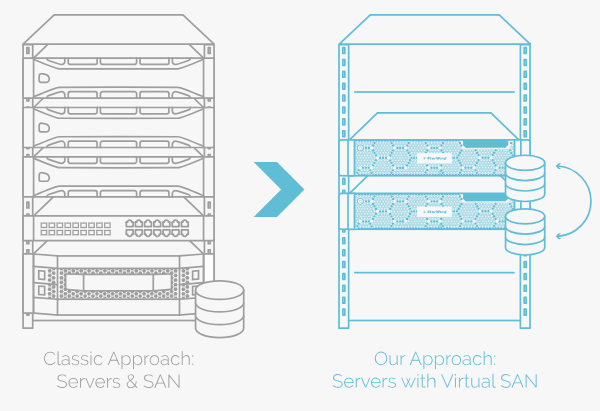 Once installed, Virtual SAN creates a fault-tolerant storage pool available to the entire vSphere cluster. VSAN users get limitless virtualization capabilities in terms of features, storage capacity, and cost-efficiency. Enterprise-level functionality and performance are available in the infrastructure of your choice. StarWind Virtual SAN Free remains an SDS solution that serves the production, POC (Proof of Concept), or test and development purposes completely for free. StarWind VSAN Free provides an ample set of virtualization tools for admins, developers, and IT geeks who have the skills necessary to maintain virtualization infrastructures using only CLI. At the same time, it becomes even more appealing to vSphere users. Now, VSAN Free turns into an SDS stack with a Management UI, unrestricted features, unbounded capacity, and unrestricted production use. Licensing is, of course, different, but also differences between the two versions for Hyper-V and VMware. VMware version is licensed per node with unlimited capacity. Hyper-V version has a lot of different editions (standard, professional, enterprise, datacenter), licensed per node and per capacity (the enterprise edition has unlimited capacity, the datacenter edition has also unlimited nodes).